There were many reasons for this question. Some brands were opening up new locations, or refurbishing existing ones, and wanted to entice local consumers to check out these specific locations. Others wanted to promote local campaigns, pop-up store locations, sales or loyalty programs (for example, end-of-year sales, 2x points for the weekend, etc.). And others were facing local competition and wanted to keep their brand top-of-mind with their local consumers. In addition, some of these brands have franchisees who want to use their location-level marketing budgets to increase sales at their store, instead of using overall brand marketing budgets. Our product team was intrigued but first needed to understand what’s currently out there for location marketing and if we could make something that better solves your needs. The main challenge is wasted advertising spend due to bad identification. It’s often difficult to know if someone bought at a specific store or location, so the solution is to send out advertising messages based on DMA (Designated Market Area, which is geographic area targeting) or zip code through IP data. However, the accuracy of IP data varies widely across service providers. The risk is that location-specific messaging goes to people in the wrong area. And if you can’t measure sales at the location level, especially offline sales, you can only guess if messaging translates to revenue. This solution is just not good enough. As marketers, you need to know who is shopping in your stores, which specific store(s) they purchase in, how your marketing messages tie to revenue and how both online and offline behaviors impact the shopper journey. To be successful in driving customers to specific stores, focus on three unique components: Identification, personalization and reporting. You need the ability to identify the best local audience for individual locations. For our product, Location Driver, we decided to do this based on purchases (online and offline), online interactions and location data. Selecting the right individual takes into account a combination of location-level sales activity with our proprietary intelligence (preferred shopping area, where they live, their location at the time of impression, preferred location and more), to determine which local consumers are in-market to convert at a specific location. 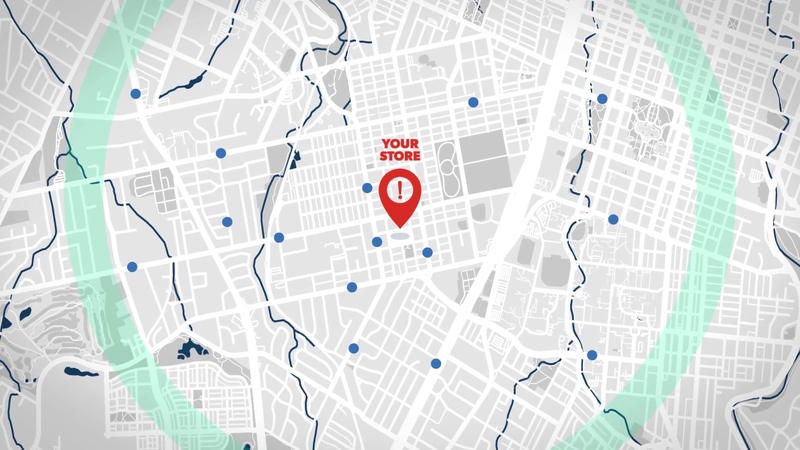 We use a range of signals to drive consumers to physical locations, whether that be a special assignment, prior purchase history, geo location such as residence or IP and other profile attributes, to ensure that you're speaking to people with the highest potential to engage with these stores and drive outcomes. You don’t want to cookie-bomb a large number of people with the same message; instead you want to give your customers personalized messages. In order to personalize ads at the location level, we determine which store within the geo area is correct to reference. This ensures that every impression is personalized with location-specific CTAs tailored to each local consumer. The ads themselves can also include map navigation to that specific location and personalized offers and content based on what people browsed online, without showing something they already bought in store. This demonstrates that connection between online and offline data to inform the advertising. Guessing at a return on marketing investment isn’t how you prove your value. You need a full view of the impact of your marketing spend at your location(s), as well as how it drove enterprise-level performance across consumer buying channels (including online to offline sales). Similar to our other solutions, we provide transparency into results, including 24/7 reporting and data files of every impression and attributed conversion for validation. Our reports include store specific sales data for each store campaign. As a result, each franchisee or corporate budget holder knows their ROI during a campaign at a specific store. Suffice to say that we believe location-level marketing to be an important tactic for many brands. But you need identification, personalization and reporting to do it well. We created Location Driver to help you reach your location-level marketing goals. To learn more about location driver and the potential in location marketing for your brand, watch the video below. If you have any questions, let us know.